Sometimes simple sides are super satisfying. Roasted root vegetables. Glazed in garlic. Refined with rosemary. An addicting accompaniment. Oh how I wish I could have gone on with the alliteration but I really felt like I was grasping for straws. So these potatoes aren’t really anything fancy. What they lack in looks they make up for in taste. These potatoes were inspired by the ridiculous Sweet Potato Fries from Smashburger. Their fries are coated in a garlicky, rosemary butter (or oil?) that makes them outrageously good. I know they are a burger restaurant but I would go their just for their sweet potato fries. Since I didn’t have many sweet potato fries on hand I substituted a few red potatoes from my parents’ garden. Speaking of gardens… I stole, err borrowed?, err got permission to take, some rosemary from my neighbor’s plant. Note to self: plant rosemary next year because it is your new favorite herb. 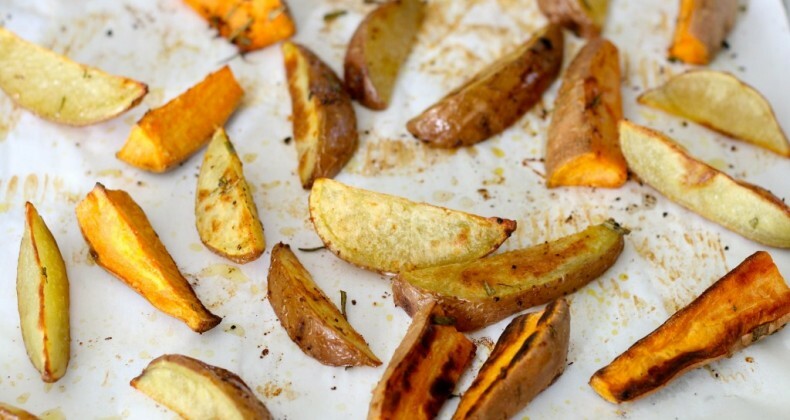 The rosemary, the garlic, the potatoes combine to make the best darn “fries” ever. They go particularly well with grilled food. Serve with burgers, chicken, or grilled fish for a complete dinner. 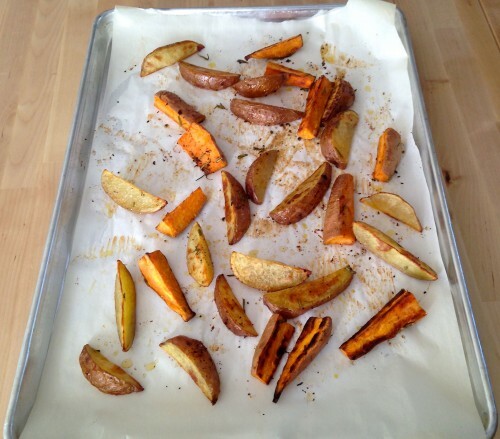 Wash and dry sweet potatoes, cut into small wedges or fry shapes. In microwave safe dish combine butter, oil, and garlic. Microwave for 15 seconds to melt butter and make garlic fragrant. Toss potatoes with garlic oil and rosemary. Spread in even layer on baking sheet. Bake for 1 hour turning potatoes after 30 minutes. Sprinkle with salt before serving. Omg yum! I want to eat these! My girls are sweet potato fries lovers. 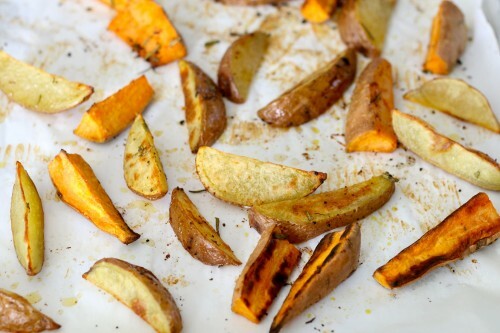 I’ve never cared for sweet potatoes in any form, but I would totally try this recipe with regular potatoes. Maybe a mixed batch of both for me and them just like you did here. The spices sound super delicious. Thanks for sharing! These are some good looking fries!! My family loves potatoes “fries” that are baked, but I haven’t tried this flavor combo yet. I’ll have to try it out soon! Yummmmmm!! 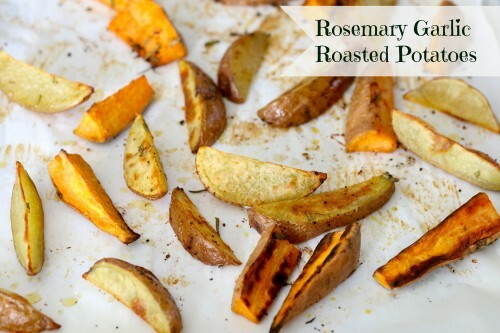 I love sweet potatoes and rosemary….must try this soon!!! !